Way Home, originally uploaded by [Zakkaliciousness]. Afternoon commuting on Knippels Bridge in Copenhagen. It's not hard to spot the tourists. They're at the front of the queue with helmets and biking shoes, pannier bags, chunky wheels and even a map holder. Looking totally and utterly out of place in an everday urban Copenhagen setting. Don't get me wrong, it's cool to see touring riders now and then. 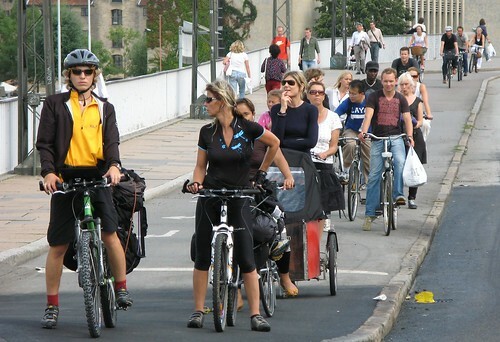 It's just that this photo really emphasises the casualness of Copenhagen bike life. The rest of the crowd behind them are your everyday Copenhageners. A woman with a Nihola cargo bike, a man with his groceries in a plastic bag.